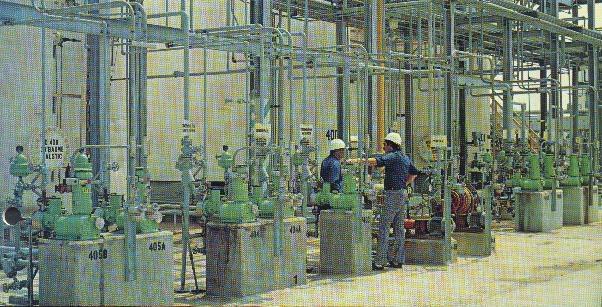 The Pump Manufacturing Division of Kemlon Products & Development Company has maintained a reputation of reliable service and consistent quality products within the Petroleum and Petrochemical Industries since 1950. Two manufacturing facilities, with headquarters in Houston, Texas, insure prompt delivery on both new and repaired equipment. A complete inventory of spare parts for our line of diaphragms metering pumps, diaphragm compressors, diaphragm pulsation dampeners, and fluorocarbon check valves is maintained to provide prompt delivery for units operating in the field. Strict quality control and inspection insure that all equipment or spare parts are manufactured from the best materials and made to exact specifications. This quality control is monitored throughout each phase of our total in-house manufacturing. In addition, each pump and compressor is tested at the customer's design conditions to insure operation in the field. Kemlon Products invites your inquiry and welcomes the opportunity to discuss your particular process applications. Whether you are looking for a metering pump to accurately inject additives into another processor looking for a pump that can transfer corrosive liquids or slurries without damage to the pump, the Bullfrog can be your answer. A hydraulically actuated diaphragm is used to pump the process. The diaphragm acts as a barrier permitting the process liquid to contact only materials specifically chosen for their corrosion resistance. The diaphragm is actuated by the movement of a plunger in hydraulic oil, enabling the Bullfrog to pump repetitive quantities with every stroke, and at high discharge pressures. The KEMLON BULLFROG pump is a precisely constructed unit designed to furnish dependable service and reliability under difficult operating conditions and continuous use. The drive mechanism is housed in a totally enclosed gearbox. Consequently the internal working parts are protected from the corrosive, hazardous environments in which the unit operates. The motor, mounted vertically on the gearbox, transmits its power through a flexible coupling to a double enveloping worm and worm gear arrangement. This double enveloping gear train is designed to transmit loads in excess of twice that of the ordinary single-throated cycloid gear arrangements used by our competitors. Laboratory studies and field reports have established that this gear train can reduce down time frequency due to gear failure by 60 percent. An eccentrically mounted actuating plate, on the pump's main shaft, then drives the plunger forward in a straight-in-line direction. With this arrangement, there is no over hung load, and a smooth reciprocating action is achieved. A predetermined oil level in the gearbox places the worm, worm gear, and main shaft under the oil level. All other moving parts are freely lubricated by the back and forth movement of the actuating plate in the oil bath. This self lubricating design insures perfect lubrication of all parts, resulting in longer life and lower maintenance costs. The PLUNGER HOUSING of the "Bullfrog" pump is constructed of high tensile strength ductile iron. This heavy-duty construction allows the unit to safely handle processes at very high operating pressures. Another unique feature of the plunger housing is a water jacket that completely surrounds the plunger chamber. This jacket enables the hydraulic system to operate efficiently over a broad range of temperatures. Cold liquids may be run through the camber, protecting the oil and plunger packing from extreme heat that may be transferred through the pumping head from the hot process. Conversely, hot fluids may be used to keep the actuating oil from becoming sluggish, should the unit be operating in an extremely cold environment. The plunger housing holds a predetermined amount of actuatuating fluid. This fluid is separated from the process by the diaphragm, and therefore never mixes with the process medium. 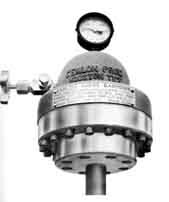 As the plunger travels forward in the plunger chamber, the oil moves the diaphragm forward which expels the process through the discharge valve in the head. On the return stroke of the plunger, the diaphragm moves back and allows the process to re-enter the head through the suction valve. Through the entire process the actuating oil exerts a uniform pressure over the total back side of the diaphragm, thus supporting the diaphragm at all points. The diaphragm therefore encounters no localized stress, and the ultimate life is greatly extended. To further protect the diaphragm, a precisely machined dish is cut into the housing that prevents the diaphragm from traveling beyond it's elastic limit. The plunger housing bolts to the gearbox from the outside. This makes maintenance repairs of replacing packing and "O" ring seals quick and simple. To insure the hydraulic system is operating at optimum efficiency, Kemlon has provided a hydraulic relief valve and automatic oil compensating device. 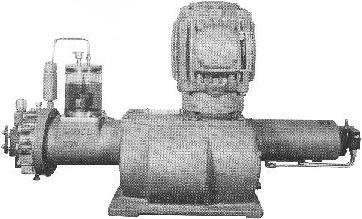 The purpose of the relief valve is two-fold. Located on top of the plunger housing the main relief valve allows hydraulic oil to be ejected from the chamber in the plunger housing into the oil reservoir, also located on top of the housing. This safety feature is activated whenever the pressure in the hydraulic system exceeds the pressures which could occur due to blockage of the process downstream. Aside from the main relief valve, the system incorporates a poppet air bleed valve. This small valve allows any entrapped air bubbles to pass from the oil chamber in the plunger housing into the oil reservoir and thus out of the system. When set properly a drop of actuating oil is passed every 2 or 3 strokes of the plunger. This constant action insures that the system remains free of air so that accurate metering may be maintained. As the oil passes through the relief valve, it is deposited into the Plexiglas reservoir. This reservoir maintains a supply of actuating fluid so that the plunger housing is furnished with oil as it is needed. The oil level may be checked at a glance as the Plexiglas construction allows the operator to see the level within the reservoir at all times. All adjusting points on the relief valve and oil compensating system are located outside the body of the pump. This allows any necessary adjustments to be made quickly, easily, and safely. A vacuum is created on the back stroke of the plunger if oil is needed. Injector valve opens to allow oil to refill chamber to desired level. If over pressure occurs the relief valve opens to relieve excess pressure. Oil is transferred into reservoir. At Kemlon we manufacture our own reinforced teflon diaphragms. These special diaphragms are constructed of TFE teflon, * reinforced with rubber-cord. This reinforcement gives the diaphragm greater strength, and protects it from distortion and cold flow, therefore greatly extending the diaphragm life. Since the rubber-cord is used on the hydraulic side of the system, it never comes in contact with the process. Because the diaphragm is actuated hydraulically, equal pressure is exerted over its entire area thus avoiding high stress points. The process, acting on the diaphragm front surface, exerts a pressure slightly less than that of the hydraulic oil. Therefore the diaphragm "feels" only the differential pressure of the two forces. Of course, diaphragm construction can be obtained in other materials besides teflon. Metal construction is necessary at temperatures in excess of 285'F, and at pressures over 2000 PSIG. 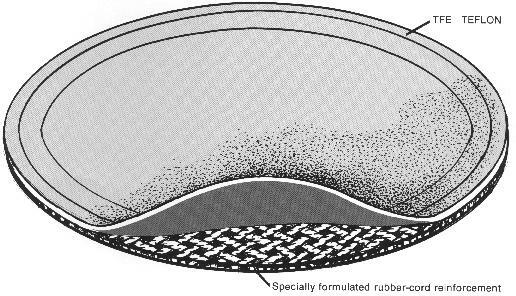 Kemlon's reinforced teflon-cord diaphragm. TEFLON or METAL construction is available for use in BULLFROG pumps or COMPRESSORS. All head and valves are precisely machined to insure maximum efficiency and reliability. The machined dish in the head has been carefully designed to allow the diaphragm to move freely, yet restricting its travel to well within its elastic limits. Kemlon offers you a variety of arrangements and materials to choose from since there are many different operating conditions and requirements found in today's Chemical Process Industry. Our flow-through head design provides great flexibility in handling a variety of fluids.... from clean liquids to viscous slurries. Various materials of construction are available which include steel, 18-8-2 stainless, hastelloy,* and monel. Our fluorocarbon model, constructed of Kynar** molded into a steel body, is very effective in handling acids or solvent mixtures. For easy installation and maintenance, Kemlon's clamp-on valves may be ordered with screwed or flanged pipe connections. Valve designs are available for handling slurries, clean liquids and fluids of high viscosity. Double ball designs are also available for use in high pressure applications. Kemlon NID Series head and valves are designed to handle clean processes containing no particles. Spring loaded poppets or balls are available, depending upon the service application. If no metal to metal contact is desired, teflon balls or poppets may be supplied. Kemlon MS Series are designed for use in light slurry applications, where small amounts of particles are present. The ball is located in a guided seat for positive seating, and may be spring loaded. The Kemlon S series is used in heavy slurry applications. This design features a spring loaded guided cone, sealing on a sharp hardened edge. This self cleaning action insures positive seating. The series F head and valves are our Fluorocarbon design, the ideal for handling acids and solvent mixtures. The construction consists of molded Kynar in armored metal. Teflon balls and diaphragms are standard construction; however, ceramic balls may be used. This design is specially useful in handling highly corrosive acids, at temperatures to 200F and pressures to 600 PSIG. 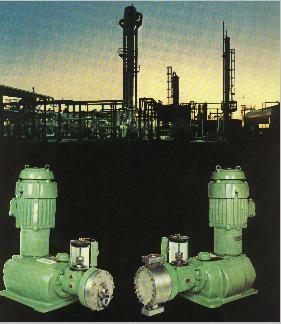 For use in very high pressure discharge applications, double valves may be used. With this arrangement, increased accuracy in metering may be obtained. Double valves may be supplied in any design. MD, MS, and S designs are available with standard construction in 316 stainless steel, carbon steel, hastelloy, and tantalum. Capacity control is just another of the many features that you get with a Kemlon Bullfrog pump. The standard Bullfrog pump is equipped with a hand wheel for controlling capacity. This easy to use wheel is located on the back side of the gearbox for easy access. Each complete turn of the wheel only affects plunger travel by 1/10 inch. Thus numerous settings may be obtained from 0-100% capacity ... and while the unit is in operation. So that the operator may see the resultant effect on the plunger travel, a stroke length indicator plate has been provided. This window, located on top of the gearbox for easy viewing, is calibrated in 1/10 inch increments. An indicator needle travels inside the plate as the hand wheel is turned, thus showing at what stroke length the unit is operating. Other methods of capacity control may also be provided to accommodate the different requirements in plant operations. A variable speed drive is recommended when great accuracy is needed while controlling flow over an extremely broad range. These drives may be obtained with A.C. frequency inverters utilizing standard A.C. motors, D.C. motor drives directed by S.C.R. 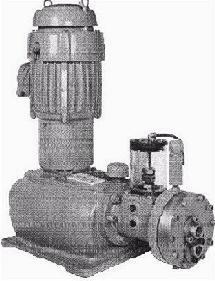 controls or variable speed transmissions such as the Reeve's Drive. All are available for installations in Class 1, Group D and Class II, Groups F and G locations. Of course, there are those instances that require that capacity be regulated from a remotely located position. Kemlon provides several methods for doing this. 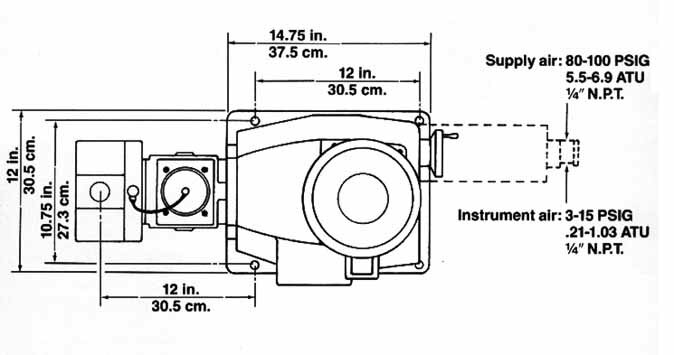 A pneumatic stroke controller, located 6n the back of the gearbox in lieu of the hand wheel, may be used to automatically position the plunger stroke length. This popular method of control operates on a 3-15 PSIG air signal, or may be equipped with an electro-pneumatic converter; converting an electric control signal to a pneumatic control signal. Standard supply air of 80-100 PSIG is required to power the unit. As the process system calls for a change in the metering rate of the unit, the pneumatic positioner automatically adjusts the stroke length so that the desired capacity is obtained. A.C. frequency controls as well as S.C.R. controls may also be furnished. These devices will ordinarily respond to one or more of the following signals: 4-20, 1-5, 10-50 ma D.C. or 0-1, 0-10 v D.C. The Kemlon Bullfrog Compressor uses the same proven design of the Bullfrog pump, using a hydraulically actuated diaphragm to compress corrosive, or highly pure gases. The diaphragm acts as a barrier permitting the gas to contact only specially chosen process materials. The diaphragm is actuated by the movement of a plunger in hydraulic oil, enabling the Bullfrog compressor to deliver repetitive flows. The heavy duty gearbox and plunger housing enables the Bullfrog compressor to compress gases at high pressures and temperatures. The automatic relief valve and oil compensator work together in maintaining the balanced hydraulic system to ensure accurate metering. Because the compressor is a diaphragm type, leak free, non-contaminating operation is experienced. The gas remains isolated and is kept clean. All seals are permanent, therefore avoiding leaks of any hazardous gas or expensive pure gas. If controlling capacity is desired the Bullfrog compressor may be supplied with variable speed or SCR controlled drives, either in explosion proof or TEFC enclosures. Find volumetric efficiency from graph at the left using CR calculated above. Determine the required compressor size. Select compressor with a theoretical capacity calculated in step 4, from the chart at the right. In some applications, if the process gas or liquid were to mix with the Bullfrog's actuating fluid, a hazard could exist. In instances like this, a double diaphragm arrangement may be used to provide an extra degree of safety in operating. The double diaphragm arrangement consists of an intermediate head, one diaphragm, and head bolts. An inert oil is used as the intermediate fluid so there is no contamination or reaction with the process should the front diaphragm fail. 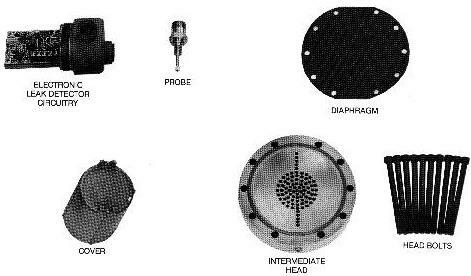 A sight glass, or our electronic diaphragm leak detection system may be used to indicate diaphragm failure, should it occur. A double diaphragm arrangement may be instal- led by Kemlon at our plant, or may be purchased as a kit, to be installed on existing units operating in the field. The KEMLON PULSATION DAMPENER is an effective way of removing harmful surges from your process system. By using a reinforced teflon diaphragm and a selected process construction of 316 stainless steel, Carpenter 20, carbon steel, Hastelloy , or Kynar , the dampener easi- ly withstands corrosive acids or solvents that attack and destroy conventional elastomeric bladder type dampeners. As can be seen f rom the graphs above the Kemlon surge dampener not only inhibits pressure pulsations, but also provides for more even power requirements which enhances pump life by reducing the peak loading on the entire drive train. Other benefits from its use include reduction of water hammer, vibrations, and smoother flows for accurate measurements. The dampeners may be installed in systems with pressures to 2000 PSIG. Each dampener comes complete with pressure gauge and charging valve. Motor HP at Max. Press.